Linda Grimes: Visiting Reality : Monday Musings on Wanting, aka "No, I mustn't! Well, maybe just this once..."
Monday Musings on Wanting, aka "No, I mustn't! Well, maybe just this once..."
A while back I blogged about wanting, and how our wants evolve over time. The things we want when we're kids, we don't (necessarily) still want as adults. Except, of course, wanting to have a hot fudge sundae for dinner. I'm pretty sure that's a universal want, never to be outgrown, unless you are a person with weird and warped taste buds. As a kid, I used to daydream about eating an honest-to-God, full-sized, cherry-on-top hot fudge sundae for dinner, instead of the meat and veggies meal put in front of me like clockwork. Okay, it's still pretty high on my list. Sure, now that I can technically have ice cream for dinner whenever I gosh darn feel like it, some the sharpness of the want is gone. There's nothing quite like the thrill of the forbidden to hone one's desire, and if the forbidden isn't really forbidden, well, some of the ... let's call it "experiential pizazz" ... may be lost. But here's a secret: if you squirt a little extra whipped cream on it, that pizazz will come right back. 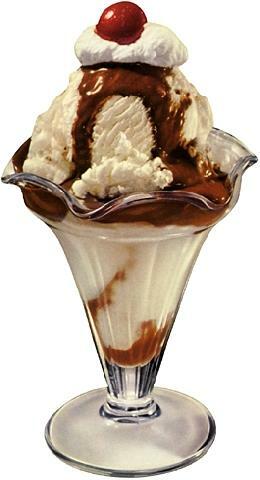 Of course, I can also recapture some of the pizazz by forbidding myself to eat the sundae, for, say, dietary reasons. But that contaminates the pureness of the want by countering it with a perfectly reasonable, albeit conflicting, want; i.e. I want to be able to zip my jeans. This whole WANTING thing is directly related to writing, too. Think about it. A piece of fiction is basically a story about somebody (a person, an anthropomorphized animal or alien, whatever -- as long as the "somebody" can be related to by the reader) who wants something. Love, money, a shiny new toy, revenge, salvation...again, whatever. The author's job is to stretch out the agony (otherwise known as "foreplay") for the length of the story. Once the character gets what he or she wants, the story is over. Unless, of course, the sneaky author has replaced the want with a newer, even want-ier want. (C) the character coming to terms with (aka "getting screwed over by") life. Granted, (C) isn't all that much fun for me to read. But there are those who find these kind of endings somehow satisfying. Masochists, I suspect. Or maybe sadists. 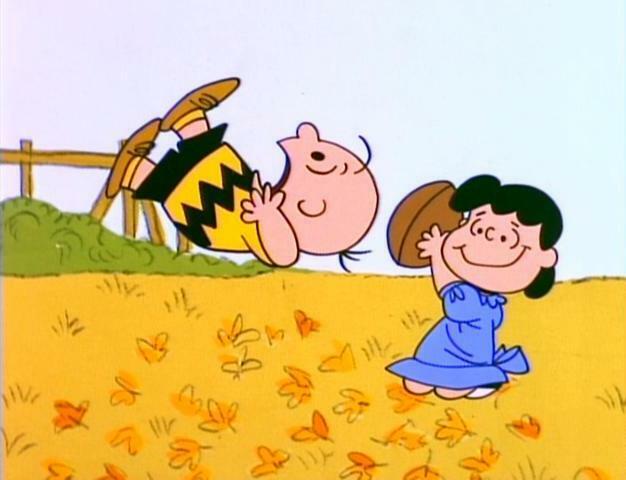 The same people who rooted for Lucy when she kept pulling that football away before Charlie Brown could kick it. So, what kind of endings do you prefer? Come on, now. You can tell me. I promise not to judge you, even if you're a sadomasochistic Lucy Lover. I like my stories to end with the character getting what they want, but only if it makes sense. Sometimes they're just better off without it. And I agree, there is no scenario in the world that cannot be improved by whipped cream. Happily Ever After - ALWAYS! You reminded me of a story. When I was a waitress at a steakhouse, I waited on 4 older ladies who swore that *this time* they would save room for the brownie sundae. "We always say that," one of them said. "We're always too full," another commented. In all my twenty-two years of wisdom, I had the answer. "Get it first," I suggested. They got the sundae for an appetizer and giggled about it the rest of their meal, all the way to the check. I bet they still remember it. I do! I want to win the lottery, hire a maid to clean my house and cook, and spend my time writing. I'm not sure where the whipped cream fits in, but I'm sure I could figure that part out. As for endings - I like them bittersweet, with emphasis on the sweet side. Something that resonates and lingers with me for a day or two. OH, I definitely want the happy ending -- and it can be either A or B. I'm okay with a character changing his/her goals. In fact, it's often better that way. I'm not crazy about tragic endings -- and yet, those are often the books that I remember longer, the ones that stick with me. So, I guess I can say I LOVE the happy endings, but I REMEMBER the tragic ones. I vote for whipped cream! But I really vote for a whole bag of tortilla chips and a bowl of fresh salsa for dinner. I like endings that fit the story. 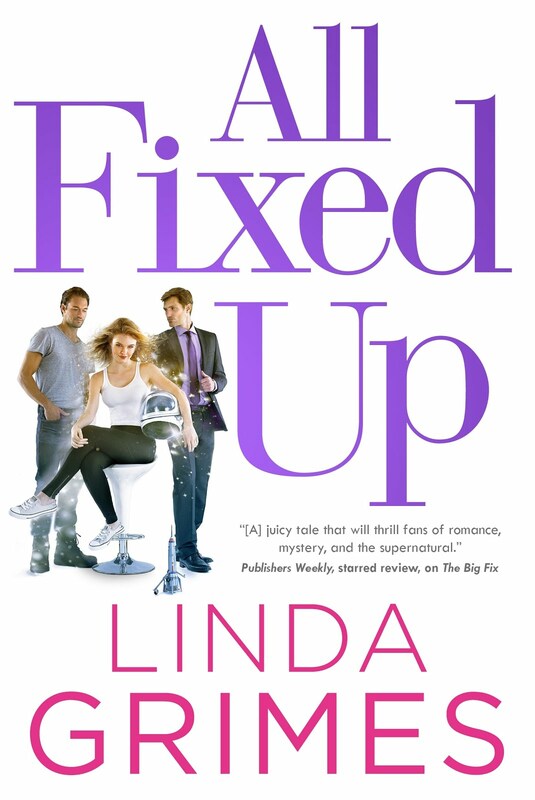 Usually I like Happy Ever Afters, but some of my favorite books don't have them. i want dessert for breakfast, lunch, AND dinner. i also want happily ever afters, always. Jessica -- Love that story! I am forever doing that -- not saving room for the luscious desserts at a restaurant. Next time, I'm ordering dessert first! Kerry -- I want to win the lottery, too. Probably won't happen unless I remember to buy a ticket, though. And, yeah, I like bittersweet -- both in books and chocolate. Carol -- Mmmm. Salty and savory. Yeah, those are a close second after sweet. Abby -- Ooooh, I like your style! Let's hear it for breakfast, lunch, AND dinner! I love happy endings, but not if they're contrived. Have you ever read hundreds of delicious tension-filled pages, only to have the writer rush through the ending as though he were nearing a deadline? Y'know, he simply ties all the strings up neatly in a bow in a few short (unsatisfying) pages? (I don't just want great foreplay, doggone it ... I want the great ending, too!) The whipped cream is optional. This'll spoil my badass image, but I'm a sucker for happy endings (though I do have a broader definition of "happy" than most people). I've given up forbidden desires completely. That is to say, I've given up on the "forbidden" part. If I want it, I damn well have it. This means I've cracked open a cold beer at 7:30 AM at my desk (the boss walked by, looked, looked away, and kept on walking), and eaten hot fudge and whipped cream in some interesting ways, times, and places. My childhood dream was to have all the candy in the world. Anyway. 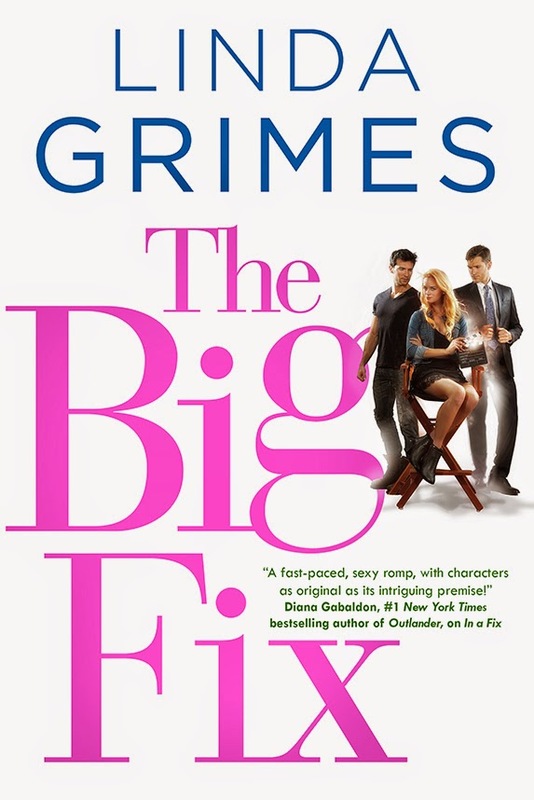 I like the endings where the main characters get what they want, even if it isn't the "happy ending" a reader might want, it makes sense for the character. Okay, yeah, I'm a "B" girl. BTW, I can send your kids some brain bleach if they can't get the whipped cream out of their heads. The first time I ate ice cream for breakfast I nearly threw up. But ice cream for dinner still ranks in my top 5 for things I do on bad days. I sometimes enjoy those screwed over by life endings (like the movie Roman Holiday) but not as the first thing in the morning. Or when I've had a good day. I really have to be in the mood or give me B the character realizing s/he didn't really want it after all, and getting something even better (or at least better for her/him) because that sounds like the ultimate twist at the end. Ice cream is good, but when I was a kid, I thought the greatest thing in the world would be able to have my own soda fountain, ready to dispense Coke or 7-UP at a moment's whim, as much I wanted. Later on, I worked in some restaurants, and quite frequently had to use one of those machines to pour sodas for the customers. Funny how quickly I got over that desire. I might be one of the aforementioned sadists who prefers option C. Not every time, though. Sometimes you have to settle into the couch on a Sunday night and watch A Cinderella Story and Another Cinderella Story back to back and debate the skills of Hilary Duff v. Selena Gomez. Just as an example, I mean. Ane the one with Selena Gomez is way better. I like Option C. I like thinks with which I can relate. But you know--none of the rulebooks tell you how to end a novel where you have several characters all wanting the same thing (it's like having five kids and one lollipop. Who gets it?) and sometimes one character will want conflicting things (eat the sundae or zip the jeans...eat the sundae or zip the jeans...) and sometimes two characters will want two different things, but if they both get what they want, one loses...and _somehow_ a writer has to make it all work and end up with a happy reader, if not happy characters.